This project is part of an archipelago in the most eastern part of the Water - area at Ypenburg, The Hague. It consists of 120 single-family-houses and 8 group houses for mentally and physically disabled people. The project is based on the urban development schedule of the architectural office MVRDV. Your own house with a garden tempts many Dutch people to change the city for a suburb. But in the average single-family-house these qualities are often limited to a row house with a small front and back garden. In this project we have searched for an alternative for the typical row in which houses are usually grouped. The design consolidates houses into ensembles situated around a courtyard. From the outside the blocks of houses look like one big house. These “houses”, nine in total, are situated on 3 longitudinal embankments surrounded by water. The houses are of different dimensions, which cause an alternating pattern of houses with open spaces in between, where cars can be parked. The parking squares, quays and houses are made of the same material, reddish brown brick. The courtyard forms a common space where the entrances of the houses open onto. The courtyard gets optimal sunlight due to the shape of the roof. In contrast with the bricks on the outside soft materials dominate the courtyards. The ground level consists of different kinds of (artificial) grass. The windows frame the interiors of the houses of which the facades are overgrown with ivy. 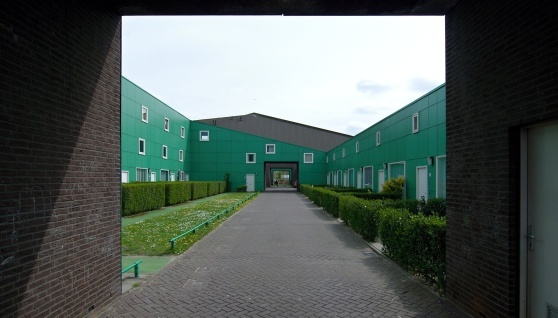 As the Dutch government has the strategy to integrate disabled people into an ordinary housing environment, two “big houses” have been adapted for 8 group dwellings for mentally and physically disabled people. The dwellings are situated on the north side of the plan, separated from the Landingslaan by water. Four communes are situated on two levels around the common outdoor space, the courtyard. The interior design has been determined by the limited mobility of the inhabitants. Hallways have been left out. A large living room borders on the individual bedrooms. Each group house has its own layout and its own colour that determines the interior. The rooms downstairs border directly on the courtyard and the water. The rooms upstairs are very special spaces due to the shape of the roof. At some points it even reaches a height of 7 metres. The large windows in the rooms create views on the courtyard, street or the water.